I’ve just finished reading this book, twice! I needed to. 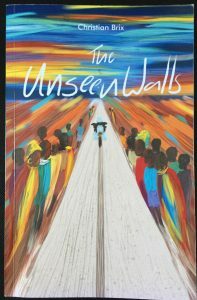 There is so much in ‘The Unseen Walls’ that’s surprising, challenging and thought provoking. It’s said that true adventure begins when you travel far outside of your comfort zone. With some excellent descriptions Christian Brix brings to life the demands of solo travel through the complexities of north-western, southern and eastern Africa. It is self-published and would benefit from the work of a good editor, and at times that’s a little distracting, but don’t let that thought put you off. I think that he’s an instinctively gifted author. He’s wonderfully honest, sometimes shocking, is insightful, questioning and humble. It’s this mix that had me page turning so fast I had to re-read it. He shares how he prepared for the journey through Africa, and then how the continent had him feeling as if he had found himself standing in front of a cultural freight train. His level of preparation, even over-preparation in some instances, absolutely did not make him ready for what he was going to find. Those who have travelled through the continent will find themselves nodding in agreement with many of his observations, yet at the same time glad that they didn’t have the same hand of cards. Being an introvert in a continent full of people who are not, has him vulnerable, stretched and asking questions of both himself and the environments he finds himself in. His honesty does not allow the unseen walls he found within himself to be watered down. His descriptions of those environments, the complexities, and situations are top notch and sometimes refreshingly blunt. At times I found myself surprised by some of his observations but that, I feel, is healthy. Why read a book that says what you expect it to? One of the threads through the book is how he builds a fine level of trust with his bike, a 660 Tenere, and how they turn into a team that works phenomenally well together. Motorcyclists who have had their bikes for a longer period of time will fully appreciate how this unfolds. I don’t think that this is a book that will have readers rushing to pack their panniers to ride Africa. However, I think that anyone with an analytical mind, who is curious about Africa travel and the mind games it can play, will find this man’s book fascinating. The kick is in the tail and I ask you please, don’t cheat and read the last chapters first!